The Fiat 500 probably will have a dedicated corner in Chrysler's U.S.showrooms. The Chrysler brand will handle U.S. distribution of the Fiat 500 minicar, said Peter Fong, Chrysler brand CEO and head of sales for all Chrysler Group brands. Fong said the 500 most likely will have a dedicated corner in Chrysler-brand showrooms. The limited volume planned for the 500 prevents creation of a dedicated North American retail network. About 80 percent of Chrysler's U.S. dealers now offer all three of the group's brands: Chrysler, Dodge and Jeep. Fong said no decision has been made on how many dealers will sell the 500. The plan is for the 500 to be built at Chrysler's plant in Toluca, Mexico, beginning in late 2010 or early 2011, says a supplier source. Fiat prefers Mexico mainly because of its free-trade agreement with Brazil. 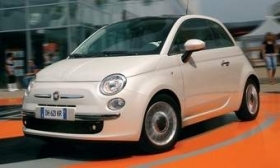 The Italian automaker, which is the market leader in Brazil, plans to export about a third of the 100,000 Fiat 500s planned for yearly production in Toluca to Latin American countries. Eventually, Fiat is expected to offer in North America the entire range of 500 body variants: hatchback, convertible, wagon and a sporty version sold under the Abarth brand name.